Pretty beat up bowl given to me by an elderly friend, I have had this collection since the early 90's but because of the condition and lack of my knowledge, I never thought much about them, they have been boxed in my garage. 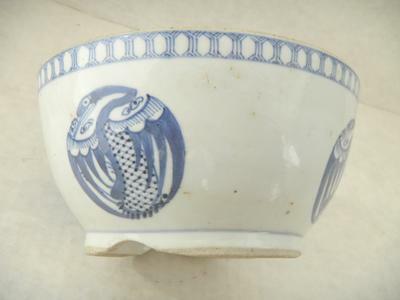 Now I would like to learn more about them and Chinese porcelain/ceramics in general. 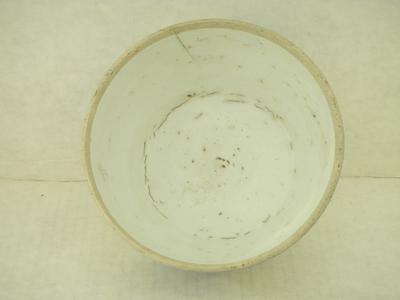 This bowl has three cut outs on base and is chipped on base rim, it also has a crack as you can see. Plus it has multiple interior cracks/holes. Now that I have done a little research I realize they are probably due to poor kiln conditions and iron oxidation. I'm sure it doesn't have much value due to the condition but would be nice to know more about it. There are no marks on the base. Thanks in advance. How much is the bowl worth ? I also have this bowl with the lid in very clean condition, do you know how much it is worth ? I cannot tell for certain what it is, but I have the feeling I have seen this before. 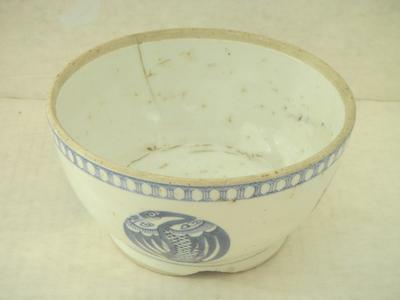 The top rim decoration and foot make it unlikely to be a Chinese antique. 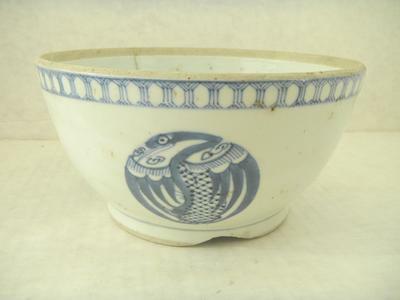 It could be either vintage Chinese or Japanese. If it is Japanese, it could be older. If it IS Chinese, then this could be a phoenix decoration rather than a crane judging from the scales on the body.